Tuareg Marketing is now looking to expand to eastern and southern states as well as neighbouring countries such as Bangladesh and Nepal. Tuareg Marketing CEO Jitendra Chauhan. Tuareg Marketing, a subsidiary of Spain-headquartered Taurus Group, was formed after the $1-billion group acquired INALSA brands in 2004. Started by the Usha Group in the mid-sixties, INALSA has seen many organisational changes, due to multiple parent companies, before it was acquired by Taurus. Tuareg has grown five times over the past decade and aims to cross Rs 100 crore in revenue in 2014. Tuareg, which sells the INALSA brand of kitchen appliances, gets most of its revenue from northern and western India but is now looking to expand to eastern and southern states as well as neighbouring countries such as Bangladesh and Nepal. The company also plans to strengthen its product portfolio, says CEO Jitendra Chauhan. Currently, it sells products in more than 30 categories through a network of more than 250 distributors and 10,000 retailers across India and enjoys a leadership position in the food processor segment. While food processors contribute 80-85 per cent of its turnover, small appliances make up 15-20 per cent. The Noida-based company aims to dominate other categories such as cooking and heating appliances as well as home and personal care products, says Associate Vice President Satish Chaudhary. "The USP (unique selling proposition) of INALSA is its durability. While the product life cycle is five to six years, our consumers use our food processors for more than a decade and they only change it for an upgraded design," says Chouhan. He spends five per cent of the turnover on marketing, while the industry standard varies from three per cent to eight per cent. 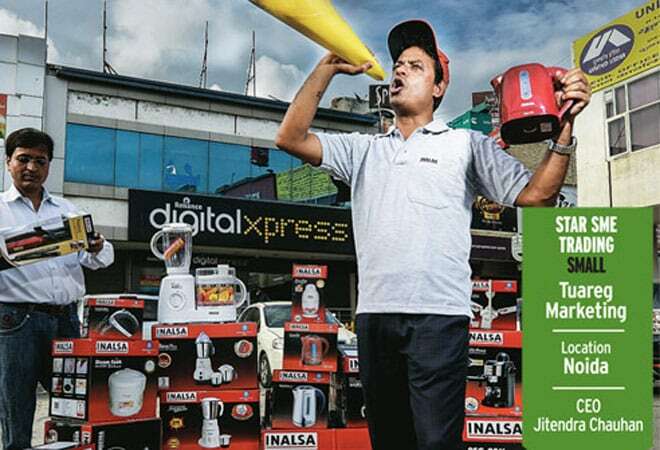 "Our distributors, too, spend 1.5 per cent of their margin on marketing INALSA products," adds Chauhan. It's been three decades that INALSA has been enjoying the leadership position in the food processor category. The average price for its food processors is Rs 6,500, while it goes up to Rs 7,500 for various models. Its price range is higher than Bajaj and Prestige and a shade below Phillips. In the next decade, the Rs 7,000-crore home appliance market has the potential to grow 15 per cent to 20 per cent. Manu Agarwal, Founder of Naaptol.com, says many other factors are influencing the rising popularity of kitchen appliances as a category within the e-commerce framework. "Customers are getting more refined about their choices in their kitchen. Customers are choosing kitchen appliances that allow them to further customise their kitchen the way they visualise." Gulbahar Taurani, Director, Domestic Appliances, Philips India, says the popularity of food processors in India is growing because the rising number of working women and changing lifestyles has made multi-tasking a necessity. This is prompting several companies to tap into this demand. Chauhan is aware of market dynamics. "It's a highly fragmented market where every player is doing everything. But there will take place a lot of consolidation and we are very much open to acquire some brands," he says.